This trip began in late April in Rockport, Maine. The weather in Maine at this time of year can be cold, wet, foggy and sometimes sunny. By the end of May the sunny days outnumbered the cold days. Ellida is a very special boat. John Alden designed this schooner to be fast and comfortable. 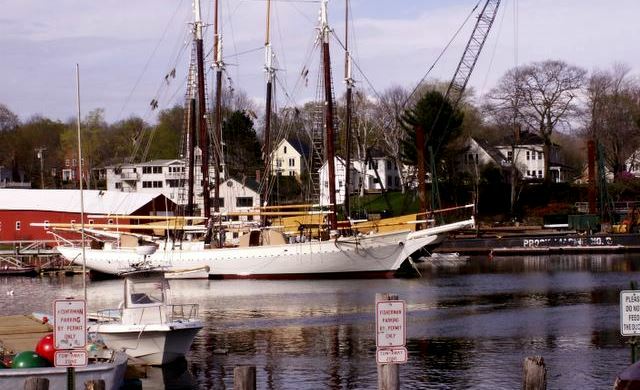 The all wooden boat was built in 1922 in Thomaston, Maine. Ellida is 80′ LOA and displaces 35 tons. She has accommodations for 10 passengers and a crew of 3. You may charter her in Olcot, Ny or St Thomas. This trip was an unforgettable experience. Maine is a very beautiful state. The coastline is rugged with large rocks, 12′ tides, and numerous small islands. The summer is the best time to visit. This is the best area to see wooden boats and of course lobster boats. Nova Scotia is really a treat. Crossing the Bay of Fundy with it’s 30′ tides and 8 knot currents does present some unique challenges. The people are really friendly and Ellida was quite a hit in every town we visited. Some fishermen even gave us lobsters, they were delicious. I have since returned many times to Nova Scotia and it was still foggy but incredibly beautiful. I will continue to return as often as possible. Somesville Harbor, Maine Acadia National Park background.